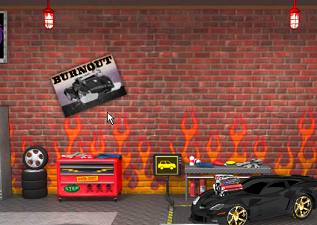 Did you know that you can CUSTOMIZE even your Garage? This cool new feature lets you personalize your lair, with not just Skinz, but also wall stuff that best suits your mood and style! Check them out! Go to your Garage by clicking on "My Garage" button on your Dashboard. After choosing the the skin that you want, you can now put up stuff on your wall and arrange them according to your style! First click on the Garage Stuff button. 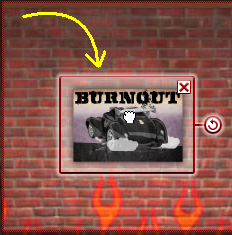 This will open your Garage Stuff selection box, and will make your Garage wall customizable. Select the Garage Stuff that you want to put up on your wall. Drag and drop the item within the editing space. If you decide to move the item to a different spot, just drag and drop the item to the spot where you want it to be. You can also change the the wall item's position by clicking on the "Rotate" button, and move the item to desired position. 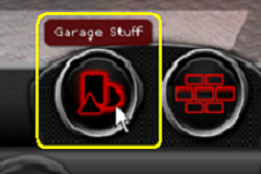 After placing the item on the spot and position that you wanted, simply click on the the "X" button on the upper right hand corner of the Garage Stuff selection box to exit your garage wall editor. If you think the wall items you got are not enough, you can buy more Garage Stuff from the RZ Shops. Get cool Posters, Plates, Signs, RIDE parts used as accessories in your Garage, and lots of other stuff.